The Digital Bradley Smoker adds a whole new dimension to your home or restaurant food preparation, and is really easy to use.. This 4 Rack has a capacity of 76 litres, and contains 4 racks, each measuring 10" x 12.5", and about a 4" height gap between each rack. The side burner box contains a motor and has a 'hotplate' extending out of it. This box attaches to the side of the cabinet, and the 'hotplate' slides inside the large cabinet. When you are applying /creating smoke the motor turns and pushes a wooden bisquette on to the burner, where it sits for 20 minutes smouldering away creating smoke. Every 20 minutes the motor turns and sends down a fresh bisquette on to the 'hotplate'. pushing the remnants of the burnt out one into a bowl of water in the bottom of the cabinet. So, you use 3 bisquettes per hour of smoking time. Because the 'hotplate' creates a small amount of heat within the cabinet, you cannot truly 'cold-smoke' using this setup except in very cold weather. To do true cold smoking you would need to add the Cold Smoke Adapter (less than £100), which fits between the burner box and the cabinet, and piping nothing but smoke into the cabinet, with no heat at all. 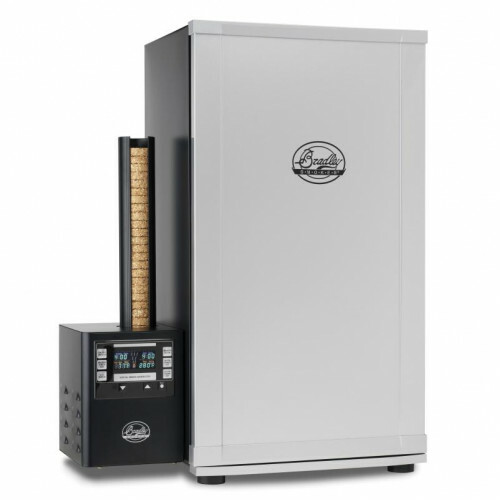 Great for creating consistently-good smoked food - perfect for restaurants, pubs, caterers where you need consistent results - just practice and perfect your ribs, brisket etc and then set the machine up the same way every time. Smoke comes out of the top vent, and the intensity of flavour can be controlled using the variable control to keep smoke in the cabinet for longer. The cabinet is insulated, and measures 17" Wide x 14" Deep x 32" High (43 x 36 x 81cm), and the Digital Controller and Feed system sits alongside and measures 7" Wide x 12" Deep x 24" High. The exterior is made from Powder Epoxy Steel, and the interior is made from Stainless Steel. Internal Heater: 500 watt cooking element / 125 watt smoking element. Maximum Temperature: Controllable up to 320F. Warranty: 12 months. Comes with Adjustable, Removable Racks, Rectangular Drip Tray and Drip Bowl.